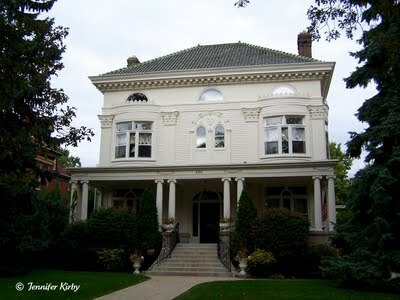 In 1882, a two story Second Empire Home was built on this site by Henry Rice, a local congressman and US Senator. He owned the home until it was purchased by Fredrick Fogg in 1894. In 1899, Allen H. Stem was contracted by Mr. Fogg to remodel the existing home, and what emerged was a Colonial Revival design with a high-end twist. The remodel was so extensive that the home was deemed new construction even though some of the original foundation and footings remained. The siding on the home seen in this photo taken in 1973 is not original to the home. But thankfully, since then, the owners have removed the aluminum siding and revealed/restored the original wood beneath. The home also has many architectural details worth noting. Doric fluted columns support the porch, with wreath molding details above. The front windows are very interesting as they are slightly curved, with transom windows above three others. The elaborate doorway on the second floor, as well as the main entrance, give the home an upscale feel of a typical Colonial Revival home. Currently a single family home, the last recorded sale was in 2002 for $1.25 Million. With a little over 8000 square feet, the home has about 7 bedrooms and 5 bathrooms. This entry was posted on Friday, January 8th, 2010 at 11:26 pm	and is filed under Colonial Revival, St Paul Historic Homes, Summit Avenue. You can follow any responses to this entry through the RSS 2.0 feed. You can leave a response, or trackback from your own site.